My Thoughts: When I first read the summary of this one, I was excited. A world where nobody can hear? And nobody has for a while. This really intrigued me. I needed to know how Mead was going to capture this. I started off reading Soundless with a bang. I really enjoyed the beginning. Learning about Fei and her sister and how they get by. How they live their lives and on top of that how it all works. We also get introduced to a boy named Le Wei (was that his name)? I really liked him. I liked how tough but yet how sweet he was. I loved how he wanted to protect his father and even Fei. As I got about halfway through the book, I started to not really want to read it anymore. It just stopped really pulling me in. Maybe its my reading mood, maybe once I knew more about why they couldn’t hear I just wasn’t as involved anymore. I don’t know. I liked this one but didn’t love it. If you like Mead’s previous works, go for it. Give this one a chance and tell me what you think. Overall: This one really pulled me in towards the beginning than it just went downhill for me. I liked it but didn’t love it. And I just wasn’t that involved with any of the characters either. It was just okay to me. Cover: I do like the cover! Almost has a mysterious feel to it, yet it’s all out there. 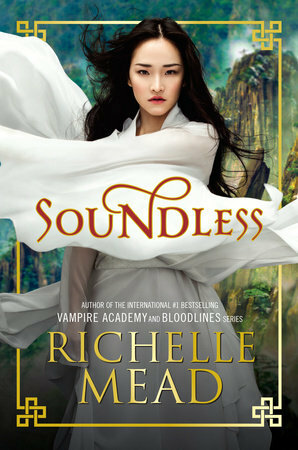 This sounds so good and I love Richelle Mead so much -- I'm sad it sort of falters in the middle. :( I'll still probably read it because I can't pass up a Mead book, but at least I'll know what to expect. :p Thanks for sharing!